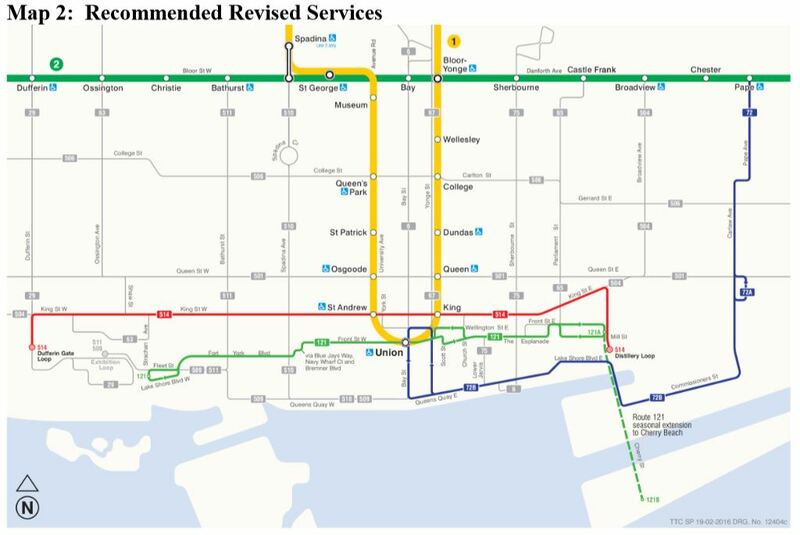 The new route structure went through a round of public consultation in the affected neighbourhoods over the winter of 2016, and this resulted in changes from the original proposal to the final version now before the TTC Board. The 172 Cherry bus now operates between St. Andrew Station (accessed at York & King) and Carlaw at Commissioners, with a seasonal extension south to Cherry Beach. The route overlaps the 72C Pape bus whose trips end at Commissioners & Cherry. Formerly, this operated as one route, but it was broken in two due to construction delays near Union Station. Many of the 72 Pape buses turn back at Eastern Avenue, and this has been the usual arrangement for service on Pape/Carlaw for many years. The 72 Pape bus with all trips terminating at Eastern Avenue. The 172 Cherry bus running from Pape Station to Union Station via Queens Quay with a loop downtown via Yonge, Front and Bay. The 121 Esplanade bus running from Bathurst at Front to The Esplanade west of Parliament, with a seasonal Cherry Beach extension. The 514 Cherry streetcar from Dufferin Loop to Distillery Loop. This arrangement had various drawbacks including gaps created by the new route structure and the omission of some neighbourhoods. The two services running south from Pape Station have been consolidated as one route, 72 Pape, with its downtown extension 72C. The 72C buses will loop via Yonge, Wellington and Bay so that they serve the transfer point with the subway at Front already used by the 6 Bay route. This places all service to Queens Quay East at a common location. Rerouting east of Bathurst to shift south to Fort York Blvd. and then continuing west to serve the Fort York area and its concentration of condos east of Strachan Avenue. Retaining the existing 172 Cherry route eastbound via Scott and The Esplanade rather than turning south at Church. Extending the east end loop to Cherry Street from Berkeley Street. The seasonal service to Cherry Beach is now part of the 121 Esplanade – Fort York route rather than 72C Pape. During the 2016 Operating Budget review, additional funding for streetcar service to Cherry Street was, for some mysterious reason, included as an optional item by TTC management rather than a normal evolution of the transit network. This funding was not approved leaving a question of just how a major new neighbourhood would get transit service. In the report on reorganized bus routes, the cost for 2016 is cited as $388k for 2016 with a full-year cost of $678k in 2017. Funding for this is “already included in the 2016 budget”. Meanwhile, the report on the 514 Cherry streetcar is cited as having no net cost because resources within the existing 504 King route will be reallocated. In effect, the 504 already has a service between Dufferin and Parliament, but it is provided by the supplementary bus service. Changing this to the new Flexity low-floor streetcars provides more capacity in the central part of the route as well as introducing accessible vehicles to it before the route was scheduled to receive them. The 504 KING streetcar carries approximately 65,000 customers each weekday, the busiest surface transit route in the city. 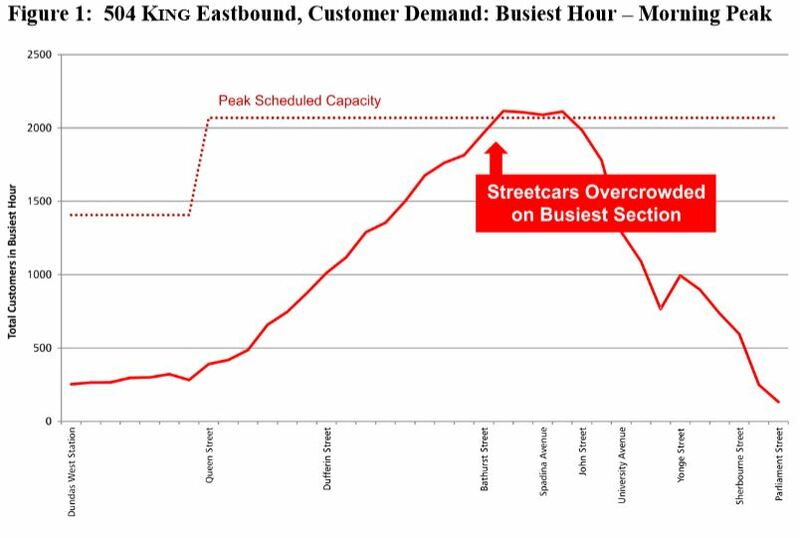 Neighbourhoods in the central portion of the King streetcar route have experienced significant growth in population and employment, with a corresponding increase in demand for transit service. Streetcar service on King Street is at capacity, and customers in the central portion of the route are often unable board the streetcars because they are already full. This is illustrated in Figure 1, below, which shows that, in the eastbound direction, for example, capacity is fully used up approaching Bathurst Street. Planned service on 514 Cherry will be every 8-9 minutes peak, with offpeak service every 15 minutes or better. This will be offset by a slight reduction in service to the outer ends of the route, but the exact details will not be known until the service plan comes out for the June 19 schedules. The intent is to concentrate service where it is most needed. This entry was posted in King Car, Service Cost and Quality, Transit, Waterfront. Bookmark the permalink. Two relevant things and one curiosity you can probably answer. 1) Will the 121 serve the condos along Bremner? Steve: Look at the route. Of course it will. 2) Will the newly minted 514 actually get to Dufferin Loop in revenue service at all times or is this likely to turn into one of those things where it short turns at Wolseley Loop the entire summer due to the Chin Picnic, Indy, CNE, Musik etc? Given it’s isolated location I can even see them operating it as a short turn service or only during certain house as the service is duplicated on all sides. Steve: It would be amusing if the new 514 had so tight a schedule that this worked against the new goal of “no short turns”. That said, I suspect you will see 514s in Fleet Loop, or maybe even turning back at Spadina via Charlotte. I also expect to see the 504 Parliament/Broadview short turns morph into short turn trips to Distillery Loop. 3) How long has the switch at Broadview been out mechanically? I was on the 504 yesterday when an operator on the vehicle ahead got out and manually flipped the switch. Steve: Months. Not sure if they are waiting for good weather to dig up the wiring/detection loops, of if this is another case of waiting for Hydro to approve the hookup. I will investigate. Back to my second point. 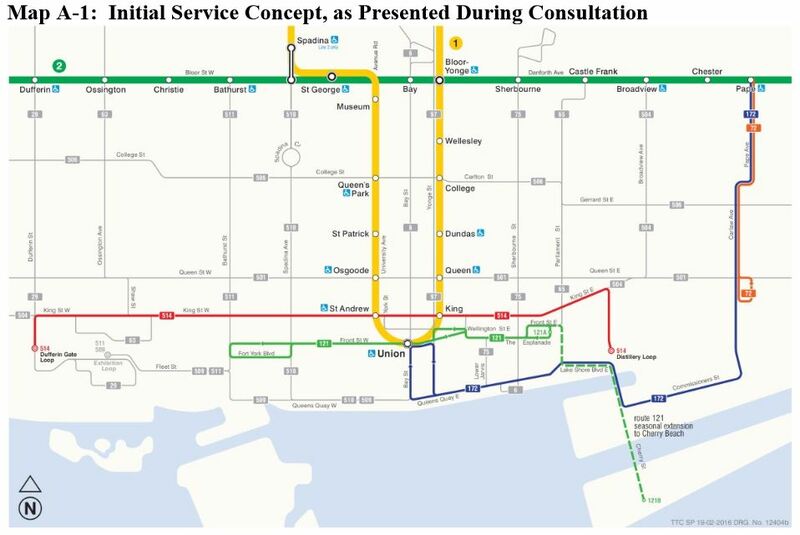 This will be a boon to the CNE and I wonder if they will run a modified 514 service from Dundas West and replace the 193 altogether if this gets approved. Even without it running to Dundas West I can still see them replacing the 193 with the 514 much like the 521 a few years ago. Steve: Considering the planned 514 headways, it is a very small boon. As for a return of the 522, that would be a separate route. The real question of how many buses and streetcars they have during the CNE schedule period. Good to see at least a bit of change in the proposals stemming from what I can only assume was customer feedback. And on a completely different note, these changes might actually help the streetcar congestion at Broadview Station (I can’t comment on the west end as I don’t often go there.) Certainly, once King switches to the new streetcars, there will be no spare room at that loop. To David, I would suspect it has to do with the 514 route doubles over the 504. It’s a bit of numerical continuity. 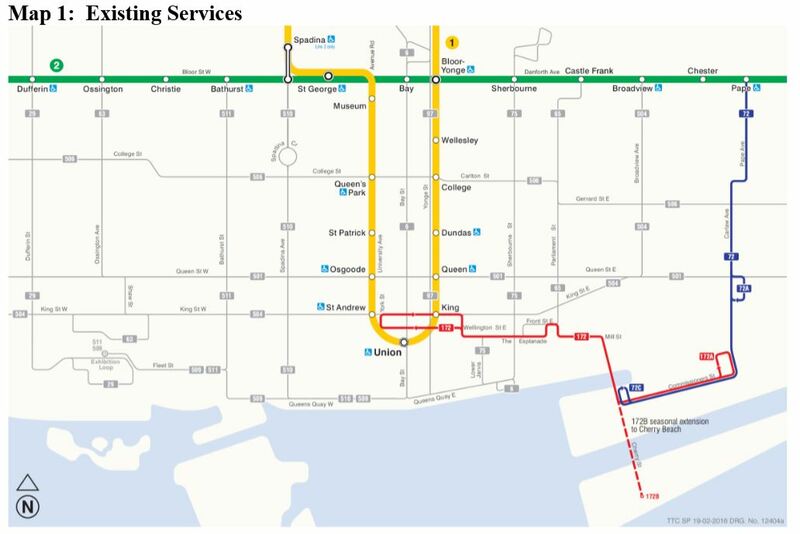 Looking at the map it would seem the optimal terminus for the 121 route would be either Exhibition or Dufferin loops with connections to GO and Dufferin buses. Seems better for Fort York residents who travel GO Lakeshore West to connect at Exhibition Station and avoid the congestion at Union. Its such a short extra distance and avoids a forced transfer to 509/511. Is Dufferin Gate Loop a new (and improved) name for Springhurst Loop? Steve: Actually, the official name for that loop is Dufferin Loop. The 121 Esplanade – Fort York bus makes several turns and curves along its route. I can see delays with those turns. Guess no articulated buses for the 121. Steve: Not as if it will ever need such large vehicles! Since next Thursday is Maundy Thursday, the day of the Last Supper, and since there were 13 people at the Last Supper perhaps the TTC has developed the an allergy to the number 13, triskaidekaphobia runs deep in certain western cultures. Steve: Hmmm … plausible … but they’ve been using the number “514” to talk about that route for some time now. I was curious as to why 121 looped via Lake Shore-Strachan-Fleet instead of going east on Fleet to either Princes’ Gate Loop or Exhibition Loop. Then I remembered the westbound ROW platform prevents buses from making a right off of Fort York to head west on Fleet, forcing them south to Lake Shore. Hopefully traffic for that one block on Lake Shore won’t slow them down too much. As for the 72B, it looks like enough people agreed that it should runs southbound on Bay St instead of the original northbound routing. This should help 6 out with those George Brown loads. I feel like it will eventually get adjusted to run via Mill St between Parliament and Cherry instead of via Lake Shore. Lake Shore & Cherry is not a very nice area to be getting off at to transfer to 121 or 514 (assuming a walking transfer is accepted). It would also provide a direct connection to the Distillery District from the east, that was previously provided but is now being removed. This is 40% more capacity than what? According to Wikipedia (and god only knows if these are realistic numbers of crammed to the doors capacity), the Flexities carry 251 people, the ALRVs 205 and the CLRvs 132. Now 251 is 90% more than the CLRVs 132 and 22% more than the ALRVs 205. Now I know that level 5 loading is not possible for very long these numbers seem to question the increase in capacity of the Flexities, or is the TTC going to a more comfortable loadin level for them? Steve: Please refer to the TTC Crowding Standards in which the capacity of a new low floor car is cited as 130 vs 108 for an ALRV or 74 for a CLRV. I don’t know where the 40% number comes from. 130/74 is a 75% premium. 130/108 is a 25% premium. Apologies Steve. I did not see the link there. Spadina and Charlotte does make practical sense actually. Wolseley is kind of in the middle of nowhere. As for the 121 that will be of limited benefit really. Having worked as a concierge in residential buildings in Cityplace I can say with certainty that people have moved there because it is within walking distance of their workplace or they have a car. Not only that but the 511 and 510 service the area nicely. The eastern end of Cityplace is even walking distance to Union Station. Nice idea but I can see this ending up like the 194 Zoo Rocket. I’m glad they’re trying to improve services, but I do wonder if the crowding stats on King had been taken prior to the Richmond/Adelaide bike lanes going in? I think many might be biking instead of transit if it became safe enough and continuous, and long enough, and the new Richmond/Adelaide protected bike lanes are getting pretty good, and also well-used. That is probably not the case. We recently saw that the TTC proposed to renumber the 5 Avenue to 13 in the report for Eglinton LRT proposed surface route changes. I see it as 504 and 514 both end with a 4 which is perfect for both of them to run along King. The 513 has shown up on the proposed SmartTrack map as the East Bayfront LRT. Of course that LRT has been in the works much longer than 514 but we have no idea when it would be built. I’m concerned about the AM peak westbound. It’s interesting they only presented the eastbound graph in the report. Westbound at peak, currently when there are only CLRVs running every 4 minutes, then between about 8 AM and 8:30 AM, it starts leaving people at the stops, at around Dundas, to about Sumach, where the 504 buses were all entering service – even when the streetcars are on time about every 4 minutes. Historically this was less of a problem, as many of these vehicles used to be ALRVs, and there were trippers entering service at Broadview/Dundas. Then TTC started running the 504 buses out-of-service up Parliament to Castle Frank (I have no idea why they chose Castle Frank) because of complaints about idling at/near Sumach. But this made the crowding on the 504 streetcars even worse. For the past few weeks, they have gotten a bit smarter and have been looping them up Parliament, east on Gerrard, and south on Broadview – finally providing a decent service. Once the Flexities are all in place, every 4-minute service on Broadview should work. Even if they put it back to ALRVs it should work. But they can’t currently cut back to only every 4 minutes on Broadview, without making the overcrowding worse. It would be interesting to see the same graph for westbound, rather than eastbound. So close in mind. When the 121 FRONT-ESPLANADE existed Steve, it was operated out of Davenport and Old Eglinton during that lifespan. Since the two yards no longer exist, I wonder who will operate the route (Birchmount or Wilson). I think we’d be fortunate if 509 and 510 were converted over to Flexitys by June 19 let alone have new cars for new service for the 514. Bombardier hasn’t shipped a new car in 6 weeks! How long has the switch at Broadview been out mechanically? I was on the 504 yesterday when an operator on the vehicle ahead got out and manually flipped the switch. They just rebuilt this intersection! Steve: You are thinking of Broadview and Queen. The intersection at Dundas is on the list for next year. In any event, the wiring and electronics for switches is usually installed separately from track construction projects. 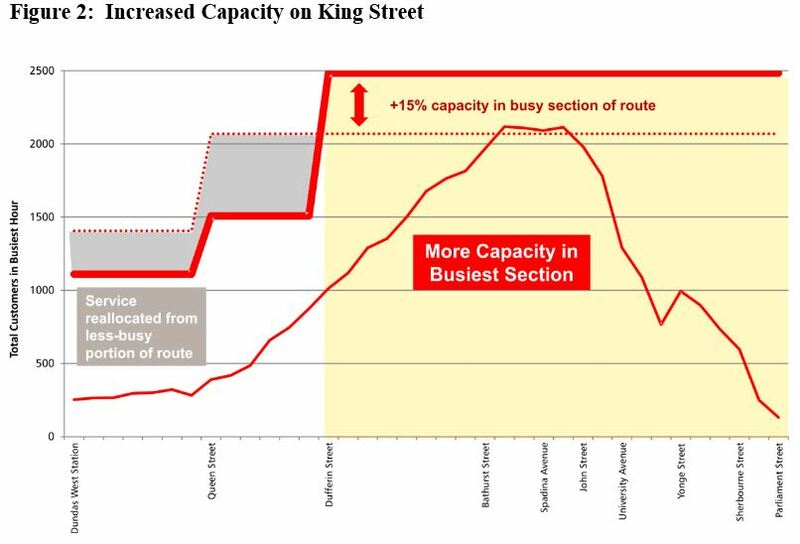 Given where peak demand is supposed to be located along King West, and how TTC say that running 514 to Springhurst Loop serves that optimally, one wonders why the supplementary buses are running all the way to Roncesvalles (as the Cherry report says above) and presumably will continue to until 514 begins? Well if Birchmount had 172, they can just operate 121. Pretty much the same route. I’m sure 121 will use the same amount if buses 172 had. Why is TTC so reluctant to extend the Parliament bus down to George Brown Via Queens Quay. 121 should be extended to Commissioners and Cherry at least. I wonder if TTC will eliminate 72A Eastern, it really only runs on Sunday morning, just before the subway opens. What TTC should have done was keep 72A to Union, and 72B to Eastern. That’s how I knew it for all my life taking 72 Pape bus, why mix the letters around. I see a gap that the TTC might fill at a later date. With 65 Parliament buses looping via Berkeley and the Esplanade (already to be served by the 121), there’s no service on Parliament between Mill Street and Queen’s Quay. Seems a fairly obvious step, once redevelopment starts picking up steam, to just extend the buses south on Parliament to Queen’s Quay, looping via Queen’s Quay, Small and Lake Shore Boulevard. Thoughts? Steve: I suspect that the TTC is trying to do this reorganization with as few new vehicles as possible. Sending the 65 to George Brown would require at least one more bus. When the service plan comes out, we will see just how they are shuffling things around. I think a small thing that the city should have done is connect Esplanade to Mill Street by putting a road in place of parking lot currently in between those streets. Seems like that would simplify access to the Distillery district. No, the 72A will make a full return. The report only said the 72A to Eastern would have frequent service. Service on Commissioners would lose frequent service. I hope that [they] assign the 72B as an extra instead of a blended service of 72A’s and B’s especially in rush hour. Otherwise the same bunching problem will arise when a bus is stuck downtown. 72B is probably going to get the similar service level as the current 172. I don’t see the TTC being really generous by allowing empty buses rolling along Commissioners like the current 72C does on a permanent basis. In general, TTC has horrible line management with routes with multiple branches. The usually end up together at the merging point and parade all the way to the end of the line. It is true that for traffic a direct link between The Esplanade and Mill would be good but NOT for a neighbourhood or a historic site. The land this road would run on is a park and part of the First Parliament site and if this, small, detour means fewer cars speed along The Esplanade so much the better. I could not find the “real” numbers at the time I wrote that but I was hoping that the relative numbers were in the same ratio. When I read those numbers I am reminded of the little car in the circus that had an unbelievable number of clowns get out of it. Though some times it feels as if the loading has reached those numbers. I was trying to inject a little humour into the situation. There was also a route 13 Berry Rd at one time I believe but I think it got through routed with Prince Edward. I always thought that Prince Edward Berry would have been a great route name. I had not heard that 513 was the eastern waterfront LRT route, thanks. Steve: Route 13 was also used for the Neville Park shuttle bus that operated during construction from Kingston Road down to Queen East. It ran over the former route of a spur from the Kingston Radial south via Blantyre to “Victoria Park”. This was a short-lived summer extension made obsolete by extension of the Queen car to Neville Loop. I think the bus changes are far more beneficial. Ridership on Pape could jump significantly as the new route roughly follows a DRL corridor. Add in new condos from a redesigned Gardiner, and this could be one of the most used routes in the city. The Fort York Esplanade route is also long overdue, and will likely not only pick up the local communities, but those heading to destinations along Front St West. Only thing which perplexes me is why it ends at Bathurst, rather than weaving itself into Liberty Village? Steve: I think an important distinction here will be the service level. When we see the schedules later this spring, we will know just how convenient the new east-west services will actually be. I really love the fact people who visit this page know what triskaidekaphobia means. I’ve wondered if it could be built as narrow bus-only road. Steve: And you honestly expect local traffic would stay off of it? I’m guessing they went with “Cherry” for the new 514 streetcar route because “Dufferin” is already being used for the 29 Dufferin bus route. The 506 Carlton is named “Carlton” even though College Street and Gerrard Street are longer streets than Carlton Street, so why not the 514 Cherry. HEY! Dufferin Street is getting a streetcar! Okay, it’s only between King Street West and the (Old) Dufferin Gates, but it’s a small step. I live near the Esplanade. The 121 is not a new route. It ran for a decade or so, a decade or so ago — along a very similar route to this iteration. One of the worst implementation details concerned the bus stop on the north side of Front, at Union Station. East and west of the stop were spots for taxis to stand and wait for passengers. Regular auto drivers, who wanted to pull over and wait to pick up a spouse, used to routinely pull over and wait in the bus zone. During rush hour there was a fifty fifty chance the driver would have to double park, to let off passengers. Of course this meant the driver couldn’t deploy the door ramp. It was a real hardship for elderly passengers. At least some of these rogue drivers had to know better, because I used to see them over and over again. Shameless. I remember going over to chew out one of these guys, because his rogue parking made an old lady have to take a big step down to the pavement, not to the curb, and the guy ignored me, stared straight ahead, while he rolled up his power windows. He was one of the regulars. All this was before the days of Uber. Up until the re-implementation of this route a commuter who texts for an Uber car to pick them up at Union Station has literally no-where for that car to pull over, because all the pull over spots are allocated to real cabs. If room is made for the 121, I think we can anticipate Uber cars interfering with the bus using the bus loading zone. It is the perfect place for a robot camera to issue tickets. Fun fact(?) When I added the table entry for the 514 in the wikipedia’s article on the Toronto Streetcar system, I did so by copying and modifying the entry immediately above it, the 512. I commented out the hidden complicated meta information for the length of the 512 route, planning to modify that info when I figured out the length of the 514. Dufferin to Sumach — google directions says thats 5.9 km. King to Dufferin loop? 500 metres. The Cherry Street spur? 700 meters. That makes it 7.1 km — the same length as the 512. Well, I thought it was fun. After the 13 Berry Road route was combined with 66 Prince Edward, there was a 13 Rouge Hill which ran from Rouge Hill GO station to Metro Zoo, from the zoo’s opening to sometime in the 90s. Minor error but 72C Pape never handled the seasonal service to Cherry Beach nor was there any proposal for it. I believe you meant 172 as per the first map or possibly 72B prior to the Union Station construction. Steve: Yes, I meant the 72B as it then was. I was using the new naming of the Union Station service here because 72A (the old Union service that did not go to Cherry Beach) is no longer associated with that branch. Have you seen the You Tube video of the car in England that tries to follow a bus onto a bus only road only to have a large heavy metal pipe rise up out the ground off which it sort of bounces. It would definitely stop cars but they would probably try to sue. How about extending the new 121 bus service to the Liberty Village area via Strachan Ave., Liberty St and Dufferin to Dufferin Loop as a parallel service to downtown? I wonder if they are averaging the streetcars. Two LFLRVs (130*2 = 260) have a capacity that is about 143% of a CLRV plus an ALRV (74+108=182). Given that these numbers are approximations, I would assume that they would call this a 40% premium. Perhaps the TTC is referring to 40% increased capacity based on planned service levels. Aside from the segregated trackage on Cherry St., what other, “Transit First”, initiatives will the TTC take along King St. to help speed-up service on the 504/514? Steve: The TTC isn’t planning anything as far as I know. City Transportation has made some changes in traffic regs and signal timings, but that was done as part of the overall King Street study, not for the 514. One thought: The TTC better be installing wayside fare machines along the 514 route. They should just get rid of all automobile traffic on King between Spadina and Cherry Streets . Perhaps allow delivery and licensed taxis only with no left turns allowed . This won’t cost much to do infrastructure wise and the autos have Richmond , Adelaide, Front Streets and the cross streets . It could even be done for a test period . Get stuff done and save money doing it . Steve: 4418 was in revenue service last Saturday. The TTC put out a press release today, and that’s why 680 was reporting it. That was the “March” car. We are still owed four for April. Note that two of the prototypes are still not upgraded as “production” cars and so of the 19 cars (4400-18), only 17 are in service. That’s why there is a discrepancy between the highest fleet number and the cars actually in use.